Secret was LG’s attempt to combine style and contemporary functionality in one, but the final result was not exactly our cup of tea. Although the LG KT770 is not yet announced in a press release, it is one of the new phones of the manufacturer, waiting silently in the LG’s site dedicated to the MWC show. We are wondering why it hasn’t been touted until now – it looks as fine as the Secret and even has similar battery cover, but it is slightly larger. However, it is smarter, and LG claims it is optimized for internet and navigation, features 5-megapixel camera with face detection and it has rich multimedia features. In a few words, LG has created another all-in-one phone. 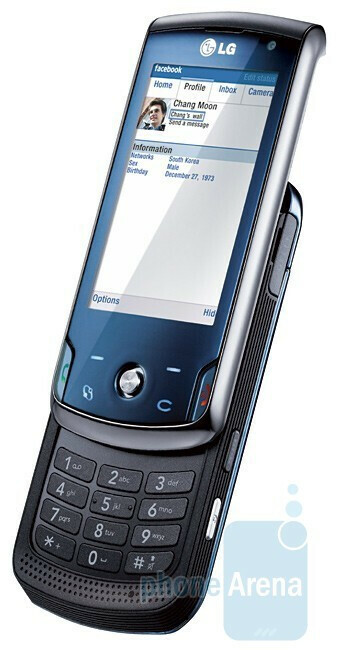 It uses the Symbian S60 3rd Edition OS, features a 2.8-inch WQVGA display, A-GPS, Wi-Fi, it is a quad-band GSM and supports 3G (HSDPA 7.2 Mbit/s). For easier navigation in the internet browser, KT770 features a 9-way joystick. We are eager to see it and test it! Currently there is no information about its availability and price, but the specs show there will be a couple of versions – one with U.S. 3G and one with the European bands.